Could "living buildings" transcend metaphor? A "Living" Building? EHDD, The David and Lucile Packard Foundation, Los Altos, CA. Photograph by Jeremy Bittermann. 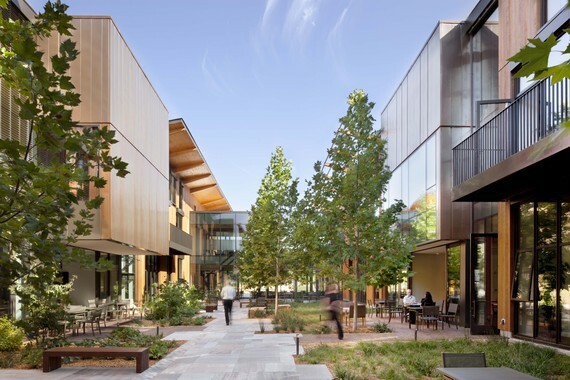 Last week in Seattle, I attended the annual Living Future "unConference," put on by the International Living Future Institute (ILFI), which manages the Living Building Challenge (LBC), widely considered the building industry's most rigorous measure of sustainability. After going several years in a row and speaking a few times, I still don't know why it's called an "unConference." The term, born in Silicon Valley in the 1990s, usually refers to a free-form gathering that rejects typical features such as one-sided lectures, top-down structure, admission fees and corporate sponsors. Living Future has all of these, in addition to taking place in convention hotels and windowless meeting rooms. It's pretty much a straight-up conference, albeit a good one. Don't get me wrong -- I fully support the ILFI and the LBC. However, because I do, I want the language to be stronger. Words matter, and unclear terminology can alienate people, spread confusion, encourage co-optation and compromise credibility, all of which happen routinely with both "sustainability" and "green." If the Living Building Challenge represents advancement in the green building movement -- and I think it does -- shouldn't its terminology also signal progress by bringing greater conceptual clarity? So, when the ILFI declares, "Projects that achieve Living Building Status can claim to be the greenest anywhere," I wonder whether that's overreaching. Is it true that no building could possibly surpass its vision? And how can you claim to be the "greenest" if you don't first define what you mean by "green"? Is a "living building" merely a "green" building, but more so -- the superlative of greenness...? The concept of a "living" building is far from new. Since the dawn of building, architects have compared artificial structures to natural structures, and a century ago Frank Lloyd Wright used the term organic to refer to "living architecture." What's possibly different, however, is that in the past architects used nature as a model for form, whereas now they speak of it as a model for function. "Imagine buildings that are built to operate as elegantly and efficiently as a flower," the LBC encourages us to do. Architecture shouldn't look like a flower -- it should act like one. This is the core concept of biomimicry, which uses the lessons of nature to stimulate innovation. Biologist Janine Benyus, who keynoted this year's Living Future, popularized the idea in her 1997 book, Biomimicry: Innovation Inspired by Nature. "What if buildings were alive?" architect William McDonough often asked during the same period (late '90s, early '00s). "What if our homes and workplaces were like trees, living organisms participating productively in their surroundings?" he wrote in 2002. I worked for McDonough at the time, and while I found his vision to be inspiring, I struggled to reconcile the differences between a building that is "alive" and a building "like a tree," the language shifting back and forth between fact and metaphor, life and like life. Now imagine a building that is literally alive -- not just a place that emulates or enhances life but a structure that is in fact alive, in the same sense that we would consider any creature to be alive. What would it take for architecture -- or any artificial thing -- to be understood this way? 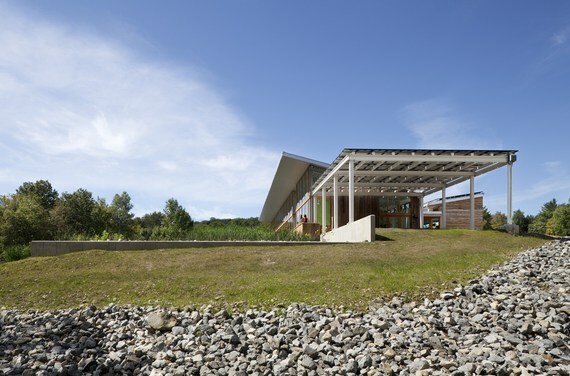 BNIM Architects' Omega Center for Sustainable Living in Rhinebeck, NY, is the first building to achieve LEED Platinum and "Living Building" certification. Photography by Farsid Assassi. Back then, I scoured scientific literature for definitions of life. If we could create a building with all those qualities, could we agree that it is alive? As it turns out, there is no perfect consensus on what separates the living from the non-living. Although biologists often list several traits -- growth, reproduction, mobility, etc. -- virtually all of them have natural and artificial exceptions. Crystals grow but are not considered alive, and computer programs have reproduced virtually every characteristic associated with life. Is software alive? "Life is fundamentally independent of the medium," writes Claus Emmeche in The Garden in the Machine: The Emerging Science of Artificial Life. Christopher Langton, who coined the term "artificial life" in the '80s, explains: "There is nothing in its charter that restricts biology to the study of carbon-based life; it is simply that this is the only kind of life that has been available for study... Certainly life, as a dynamic physical process, could 'haunt' other physical material: the material just needs to be organized in the right way." What is the "right way" to be organized? In What Is Life? (1944), the Nobel physicist Erwin Schrödinger narrowed it down to a single criterion -- negative entropy, or "negentropy." Twenty years later, when NASA asked biologist James Lovelock what signs of life he'd look for on Mars, he replied simply, "I'd look for an entropy reduction, since this must be a general characteristic of life." The Second Law of Thermodynamics states that, unregulated, the universe tends toward a state of entropy, or equilibrium. Without outside energy applied to keep them intact, inanimate objects tend to break down, wear out, fall apart. Living organisms, however, do the opposite, repairing and regulating themselves, until they begin to decline and die. Life is the opposite of entropy. If a building or other designed thing could resist or reverse entropy, by Schrödinger's and Lovelock's thinking, could it be considered alive? What if the physical material of a building were "haunted" by life's physical process the way Langton describes? Some conventional metals, such as copper and CorTen steel, get stronger as their surfaces oxidize, forming a protective patina; exposure to air that breaks down other materials only makes these more resistant to wear and tear. New types of concrete, the world's most common building material, contain fibers that shrink in reaction to water infiltration, dramatically extending the life expectancy of the material, improving safety and minimizing waste. Every year, we could save hundreds of millions in maintenance and repair costs by using this material on bridges and tunnels. Similarly, smart sensors or actuators, adjust to stress and strain, keeping structures from buckling with sudden forces. Self-healing metals and polymers could prevent buildings from disintegrating. Last year, material scientists at the University of Illinois tested a self-healing polymer that mimics biological healing, automatically filling in damaged areas within 20 minutes and restoring mechanical function within a few hours. With such techniques, a building could protect the welfare of both its occupants and itself. The distinction between metaphorical and literal life isn't just semantics. Consider this: A 2012 study co-sponsored by ILFI's partner organization, the Cascadia Green Building Council, demonstrated that reusing an existing building can be nearly 50 percent more efficient with resources than building a new one. In fact, with even an energy-efficient building, it can take up to 80 years to overcome the harmful environmental impact created during the building's construction. "Embodied energy," a standard measure of ecological footprint, refers to all the energy used to make something, including the extraction, processing and transportation of materials. The longer the "life" span of a building, the lower its embodied energy -- and the lower its waste. The oldest buildings in the world, such as France's Tumulus of Bougon, are nearly 5,000 years in age, about the same as the Sierras' Bristlecone Pines, the oldest living organisms. Designing with materials that slow down the process of wearing out could dramatically extend the life of a building, giving it a high degree of what I'll call embodied negentropy. In other words, it could take on a life of its own. Architect Lance Hosey is Chief Sustainability Officer with the global design leader RTKL. His latest book, The Shape of Green: Aesthetics, Ecology, and Design, was a finalist for 2014 Book of the Year in the National Urban Design Awards and has been Amazon's #1 bestseller for sustainable design. Follow him on Twitter: @lancehosey.